Can Öncü was born on July 26th, 2003 in Alanya, Turkey. He was 4 years old when his father, a big motorsport fan, bought him and his twin brother their first mini-bikes. Along with his brother, he has shared the same passion as his father since childhood and they have always competed alongside each other, participating in the same championships and achieving great success despite their youth. In 2011 he made his debut in the Turkish Motocross Championship, winning the title. In 2012 he also won the East European Supermoto series. In 2013, Öncü moved to the European Supermoto Championship with the help of KTM, marking the beginning of his professional relationship with the manufacturer. With them, he managed to win the European championship and the Turkish Supermoto Championship for two consecutive seasons. In 2013 and 2015 he also claimed two more titles in the Turkish Motocross Championship. After a season adapting to the series, in 2015 he was the winner of the Turkish Roadracing Champioship. That season he also placed runner-up in the Turkish and European Supermoto Championships, behind twin brother Deniz. In 2016 he was crowned Turkish Roadracing Champion for the second consecutive season, and managed to finish in ninth place in his debut campaign in the Asia Talent Cup -a competition in which he managed to get a best finish of second place at Sepang. In 2016 he was selected to enter the MotoGP promotional series, the Red Bull MotoGP Rookies Cup. His goal was to enter the Top 5, and he far exceeded that by finishing 3rd in the overall standings, with a total of 165 points. He claimed four wins (two at Assen, as well as at Sachsenring and Brno) and three further podiums (at Jerez, Saschsenring and Austria). Can ended his second season in the Asia Talent Cup in third place overall, nine points off the title, with a total of 4 victories -all of them at Sepang (Malaysia). In his second season in the Red Bull MotoGP Rookies Cup, Can Öncü won the title after racking up a total of five victories and five podiums. In addition, the Turkish rider completed his debut year in the FIM CEV Moto3 Junior World Championship in seventh overall, with three podiums to his name. Can rounded off the 2018 season making his debut in the Moto3 World Championship as a wildcard at the Valencia GP, writing his name in the record books as the youngest rider to win a Grand Prix and the first from Turkey to do so. 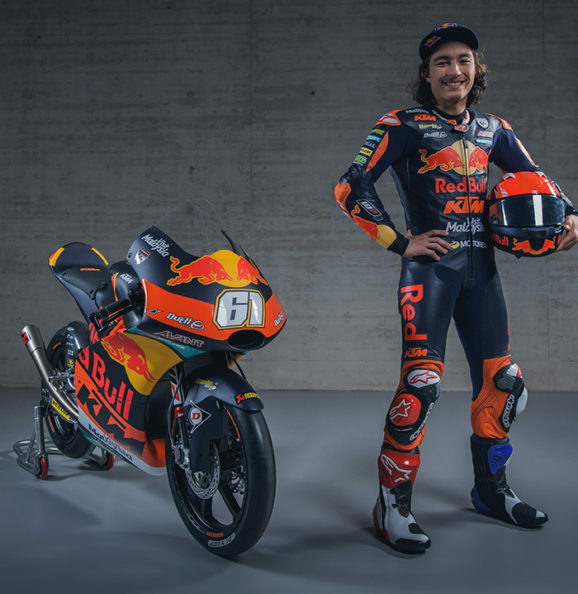 After an excellent 2018, Can Öncü moves into the Moto3 World Championship full time in 2019 with the Red Bull KTM Ajo team. He will seek to continue gaining experience and growing as a rider. Legal notice: AJO Motorsport hereby authorizes you to view and distribute information published by AJO Motorsport. Legal Notice must appear on all copies that you make or distribute.